When Prince Harry marries LA-born Meghan Markle next year, she will not be the first American in his family tree. The prince's great-great grandmother was Frances Ellen Work - a "Dollar Princess" whose life reads like a Downton Abbey storyline. Frances - known as Fannie - was born in New York City in 1857, the elder daughter of Frank Work. He was a self-made American banker who left a $15,000,000 fortune when he died. Fannie was considered "a great beauty in her youth" according to her obituary in the New York Times. "She spent lavishly, enjoying parties and the excitement of being admired in beautiful clothes," writes Anne de Courcy in The Husband Hunters. "At the same time, she was very well read, spoke French fluently, and took a great interest in paintings and furniture." In 1880, she married the English-born James Boothby Burke Roche - the son of Irish politician Edmund Burke Roche, 1st Baron Fermoy. Fannie's dad - the self-made millionaire - was not impressed. "I am an American to my backbone," he said. "If I had anything to say about the matter I'd make international marriage a hanging offence." It's fair to say James Roche - known as Jim - wasn't the ideal son-in-law. Firstly, he was broke. "He had led a life far beyond what he could actually afford," writes Anne de Courcy. He was also - to put it mildly - somewhat of a schemer. By the time he married Fannie, Jim had been a "ranchman in the west, a revolutionist in South America, a gold miner in Alaska, an explorer in Patagonia, and a blockade runner during the Russo-Japanese war," according to the New York Times. Worst of all - for Frank at least - he was "tall, good looking, with good skin, dark eyes, a dark moustache, and a sizeable dollop of Irish charm". Fannie and Jim lived in England and had four children in London (one died in infancy). But in 1891, Fannie was granted a divorce in the US. The divorce was front page news. The court said Jim had "deserted" her more than three years earlier, and had "wilfully neglected to provide for his wife". The American court also gave Fannie custody of their three children - Cynthia Burke Roche, Edmund Maurice Burke Roche, and Francis George Burke Roche. 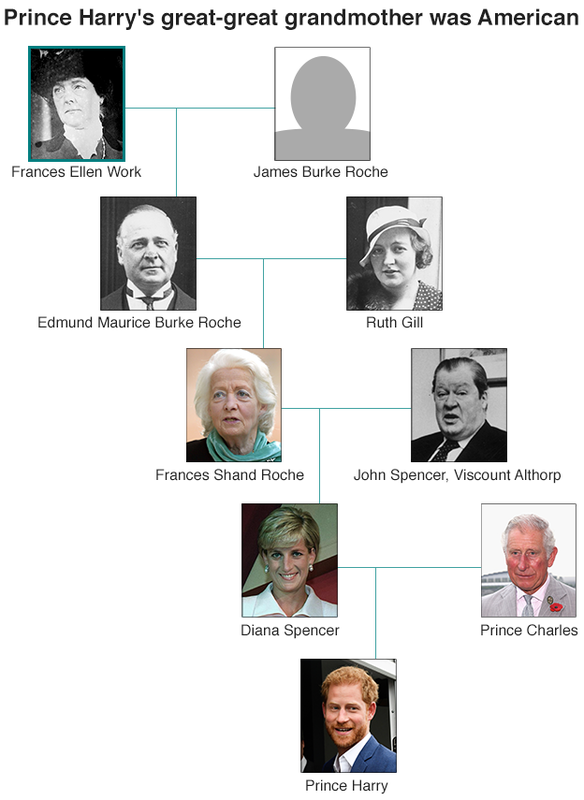 Edmund Maurice Burke Roche - who died in 1955 - was Princess Diana's grandfather. In 1905, Fannie married again - this time to a Hungarian, Aurel Batonyi. Her father was so incensed, he removed her from his will (she was later left a "small portion"). After divorcing for a second time, Fannie divided her later years between the US and Europe. Her obituary said she "entertained extensively" in Paris. She died in 1947 at her home in Fifth Avenue in New York City. Her great-granddaughter, Diana, was born across the Atlantic 14 years later. The Royal Family's links to North America don't end with Fannie Work. In fact, Prince Harry isn't even the Queen's first grandson to marry a North American. Peter Phillips - son of the Princess Royal - married Autumn Kelly, a Canadian, in 2008. The couple met at the Canadian Grand Prix in Montreal in 2003 (Peter was working for the Williams Formula One team). Before the wedding, she gave up her Catholic faith - a move that allowed Peter to retain his right to the throne (the law changed in 2015). If that seemed old-fashioned, the pre-wedding publicity was more modern. The couple spoke to Hello magazine for a reported £500,000. The ceremony took place at Windsor Castle in front of 300 friends and family, 70 of them from Canada. Prince Harry was among the guests - as was his then-girlfriend, Chelsy Davy. Prince Harry's and Peter Phillips' uncle, the Duke of York, also dated an American. In February 1981, on the night of his 21st birthday, he met Koo Stark - an understudy at the National Theatre in London. After their first date, in which old York met New York, he invited her to "BP for lunch". She thought he meant the petrol station; it was actually an invitation to Buckingham Palace. News of the relationship broke in 1982 while the couple were in Mustique in the Caribbean. Some paparazzi hired light aircraft. Others swam to the beach in scuba gear. The similarity to Prince Harry - who complained about media "abuse and harassment" last year - is clear. Indeed, the New York Post recently called Ms Stark the "Meghan Markle of the 1980s". Prince Andrew and Ms Stark broke up but remained friends. He is godfather to Ms Stark's daughter. But - no matter what Prince Harry and Meghan Markle do - they won't shake the Royal Family like Harry's great-great uncle did in 1936. The future Edward VIII met Wallis Simpson, an American socialite, at a house party in 1931. She was married to her second husband, Ernest, after divorcing her first. In January 1936, Edward became king when his father, George V, died. In October that year, Mrs Simpson was granted a divorce for the second time. In November, King Edward told the prime minister, Stanley Baldwin, that he wanted to marry Mrs Simpson. Mr Baldwin told him the public would not accept Mrs Simpson as queen. The King proposed a morganatic marriage - in which he would be King but she not the Queen - but it was rejected by the prime minister and other Commonwealth governments. On 11 December 1936, he gave up the throne. In his abdication speech, he talked about "the woman I love". The couple married in 1937 and, after World War Two, lived in France. He died there in 1972, while she lived until 1986. More than 80 years after the constitutional crisis, Prince Harry and Meghan Markle will write a new chapter in the long history between North America and the Royal Family. This one, hopefully, will be much smoother. The authorities in London: "We are Determined to do whatever is Necessary to Investigate Alleged Abuses of our immigration system"
The British Foreign Minister, Mark Simmonds, spoke Monday, July 8th, the British Parliament, for London to conduct a feasibility study on a possible relocation of the Chagossians in their native islands. The Chagossians are cautious. Take advantage of the UK economic recovery to boost exports to this market. It is the goal of Enterprise Mauritius (EM), which organizes a marketing operation on 3 and 4 April in London. It intends to promote a list of products of interest to consumers in the UK. The comments came Monday as Prince Charles and wife Camilla visited the Canadian Museum of Immigration in Halifax, Nova Scotia. The Prince was speaking to a 78-year-old museum volunteer who is a Holocaust survivor when he said, 'And now Putin is doing just about the same as Hitler,' according to the Daily Mail. The air traffic control system for London airspace has been restored after a technical failure, the UK air traffic management company NATS said Friday, but travelers can expect disruptions and flight cancellations.